(Sugar Land,	Tex., May 2, 2018) — The	Sugar	Land	Skeeters announced	today	that	the	contract	of	left-hander	Paco	Rodriguez	has	been	purchased	by	the	Minnesota	Twins. Rodriguez	is	expected	to	report	to	extended	Spring	Training	and	then	to	Double-A	Chattanooga. 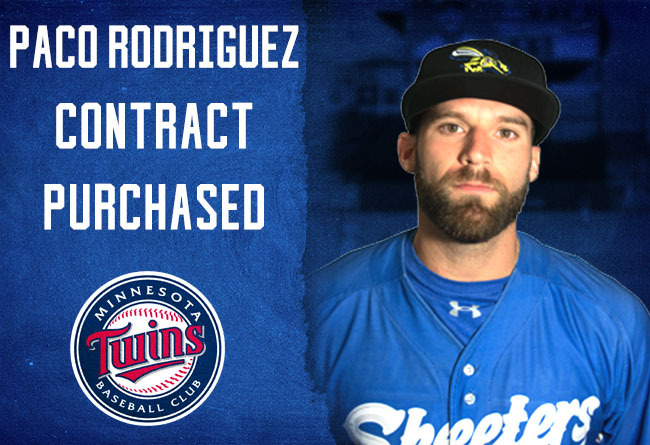 Rodriguez,	27,	has	made	two	appearances	for	the	Skeeters	this	season,	picking	up	saves	in	both	outings,	which placed	him	in	a	tie	for	the	most	in	the	Atlantic	League. Rodriguez	allowed	a	run	on	three	hits	in	two	innings	of	work,	picking	up	three	strikeouts	to	one	walk. Rodriguez	last	appeared	at	the	affiliated	level	in	2017	with	the	Baltimore	Orioles’	Gulf	Coast	League affiliate. He	was	selected	by	the	Los	Angeles	Dodgers	in	the	second	round	of	the	2012	MLB	Draft	out	Florida	and	made	his	Major	League	debut that	same	year with	the	Dodgers,	becoming	the	first	player	in	his	draft	class	to	reach	the	Majors. He	appeared	on	the	Dodgers’	Opening	Day	roster	from	2013-15	and	was	second	on	the	team	with	76	appearances	in	2013. In	124	career	Major	League	appearances	(all	coming	in	relief and	with	the	Dodgers),	Rodriguez	is	4-5	with	a	2.53	ERA	and	two	saves. He’s	struck	out	91	batters	to	30	walks	in	85	1/3	innings	in	that	span	as	well. Rodriguez	was	traded	to	the	Atlanta	Braves	in	July	2015 and	underwent	Tommy	John	surgery	in September	2015. He did	not	make	a	professional	appearance	during	the	2016	season	and was	released	by	the	Braves	in	March	2017. Before	attending	the	University	of	Florida,	Rodriguez	was	drafted	by	the	Houston	Astros	in	the	48th round	of	the	2009	MLB	Draft	out	of	Gulliver	Prep	(Miami,	Fla.). While	at	Florida,	Rodriguez	helped	the	team	earn	three	consecutive	appearances	to	the	College	World	Series,	including	the	College	World	Series	Finals	in	2011. With	the	signing	of	Rodriguez, the	Skeeters	now	have	five	players	from	their	2017	and	’18	rosters	active	with	Major	League	organizations:	OF	Jeremy	Barfield	(Triple-A	Pawtucket;	Boston	Red	Sox),	OF Cole	Gillespie	(Low-A	Tri-City;	San	Diego	Padres),	INF/OF	Josh	Prince	(Triple-A	Reno;	Arizona	Diamondbacks),	Rodriguez	(Double-A	Chattanooga;	Minnesota	Twins)	and INF Andy	Wilkins	(Double-A	Chattanooga;	Twins). Visit	SugarLandSkeeters.com	and	follow	us	on	Facebook,	Instagram	and	Twitter	(@SL_Skeeters)	for	all	the	latest	news	on	the	team. Tickets	for	the	2018	season	are	available	now	at	SugarLandSkeeters.com/tickets and	our	mobile	app. Download the	official	Sugar	Land	Skeeters	app	to	keep	up	with	the	team	all	year	long	with	news,	score	updates,	stats	and	more. The	free	app	is	available	in	both	the	App	Store	and	Google	Play. The Skeeters play	at	Constellation Field,	a	state-of-the-art	stadium	located	at	the	intersection	of	State	Highway	6	and	U.S.	Highway	90A	in Sugar	Land. The Skeeters are	a	member	of	the	Atlantic	League	of	Professional	Baseball	(ALPB)	and	play	126 regular	season	games. The Skeeters Baseball	Foundation	promotes	youth	education	and	healthy	activities	lifestyles	by	providing	support	to	culturally,	racially	and	economically	diverse	areas	of	the	community. For	more	information	please	call 281-240-4487 or	visit sugarlandskeeters.com. The	Atlantic	League	has	been	a	leader	in	professional	baseball	and	a	gateway	to	Major	League	Baseball	since	1998. Over	38	million	fans	have	attended	Atlantic	League	games	and	more	than	900	players	and	50	managers	and	coaches	have	joined	MLB	organizations	directly	from	the	ALPB. The	Atlantic	League	emphasizes	winning	baseball	games,	showcasing	the	talent	of	top-caliber	players	and	offering	affordable	family	entertainment	to	metropolitan	markets	serving	nearly	15%	of	the	US	population. For	more	information,	please	visit	www.atlanticleague.com.